As I was walking around the IU Auditorium with two of my besties (who both worked with me there in college) I began to feel sorry for anyone who didn’t go to Indiana University. I fell in love with the campus all over again, just as I do every time I visit. I don’t know that IU is the best school in the world, but it’s got to be one of the most beautiful, and I think that counts for something. Yesterday was a day of loving all over southern Indiana…but let’s start at the beginning. A few weeks ago, a couple friends of mine, who have both been mentioned in previous posts, decided that we needed to take a trip down to Bloomington. We all worked there together during college at the IU Auditorium box office and we wanted to visit with our old boss and co-worker. I could seriously go on and on about how working there was one of the best things I ever did in my life. Most of us that worked there probably can. I made amazing friends there that I can’t imagine not having in my life now. Sorry, I’m gushing. I told you. I loved it there. So we planned on Friday. Of course, anywhere I go I have to figure out if there is some cemetery or site I can visit to further my genealogical study. Well, it turns out that one of my friends, C-Dogg B-Dizzle, has her roots in Southern Indiana! I have made some mention of her Bloomington connections in previous posts, but C-Dogg had never done any research with me herself. This would be perfect! Good old Andrew let me borrow his car (which is way nicer than mine) to take the trip south. We got to Yogi’s just in time. I kind of wish now that I had taken a picture of the alcoholic beverage menu board. It was amazing. I forgot how cheap it is to drink in Bloomington. We met up with Marge and Stacy and had a great old time talking about who is doing what now and what is new in the Auditorium, Theatre, and ticketing worlds. I had my “usual”. It was awesome. I have already been to White Oak Cemetery, and was lucky to have already searched the whole thing over to find C-Dogg’s family here. Her Brosman family had been in the area for generations and happened to be buried in a neighborhood I love, just blocks from the last apartment where I lived in B-ton. 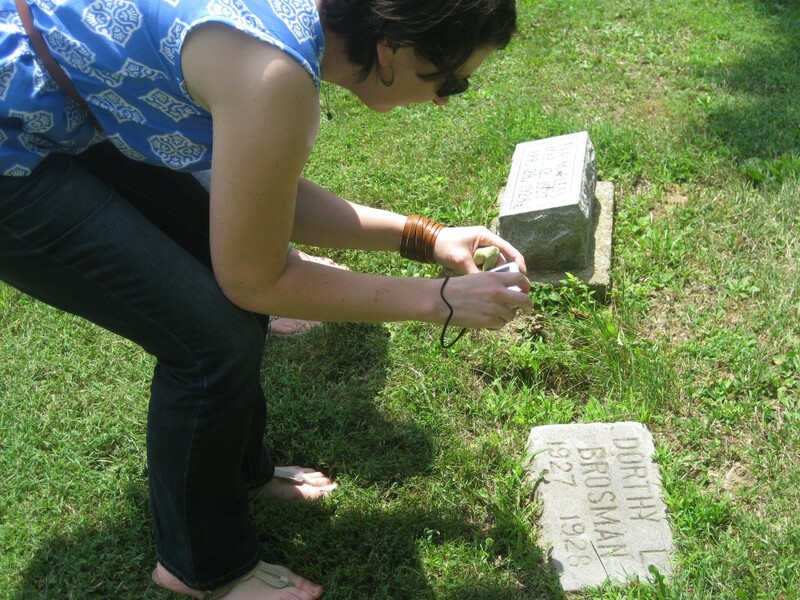 She got out her own camera and started snapping away at Brosmans that just sort of littered the west side of the cemetery. C-Dogg, getting shots of all her Brosman kin. 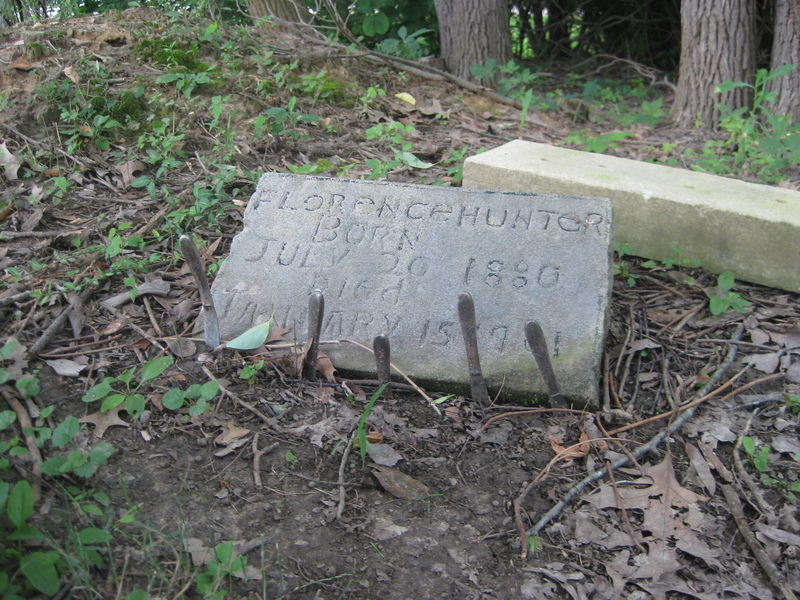 Florence Hunter born July 20, 1888 and died January 15, 1911. Cutlery (I believe they are all butter knives) is holding her headstone "in place". What is this all about? 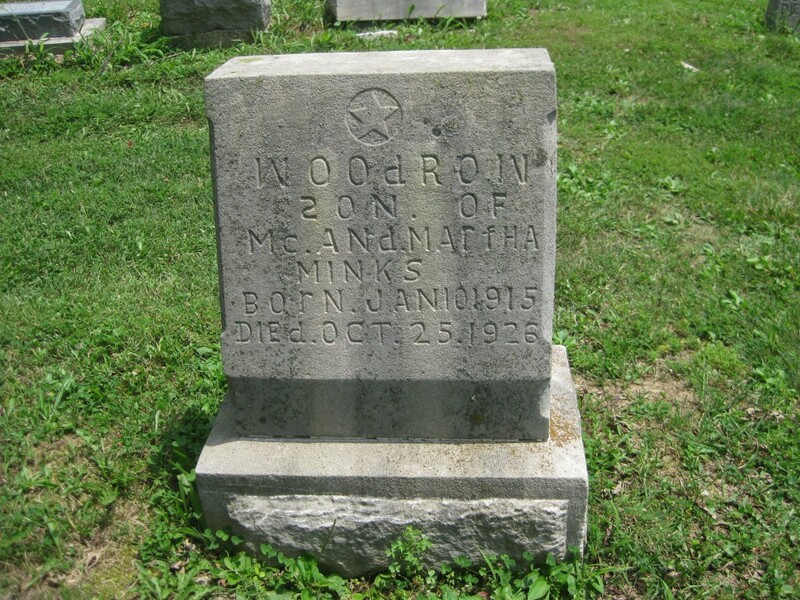 Woodrow Minks, born Jan 10, 1915 and died Oct 25, 1926. Notice the backard 'S' in "son". Weird, right? We saw a few with the letters carved in backwards. We hopped in the car and headed toward our next stop, which is sort of my dream house. I have visions of retiring early and running a bed and breakfast in the country, but close enough to a big city or town that I don’t feel like I am necessarily separated from the wider world. A few months ago I noticed a house in southern Indiana (we won’t even get into my house hunting obsession) that fits that description perfectly, and I want it, now. 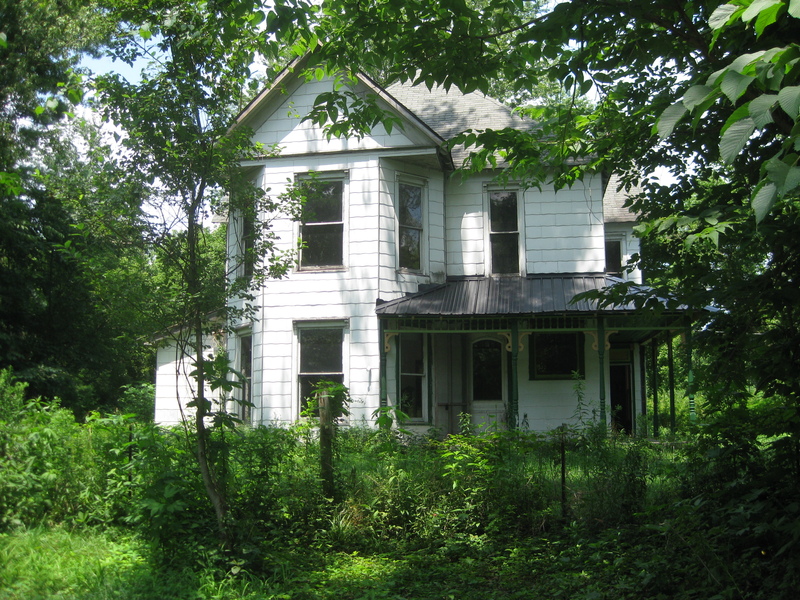 It’s an 1890 Queen Anne that is begging for someone to love it up. The interior is filled with original woodwork, staircase, doors, hardware on doors, hardware on windows, and then some. It is for sale for only $65K. I tried to convince C-Dogg to do it, since I could live vicariously through her…but she didn’t take the bait. I think she was scared off by the fact that the home is currently uninhabitable and would probably take $50-$75k to get there. Maybe Jumwaltie would do it. She seemed excited about it as well. "Buy me, Erin! If you can't save me, I'll die!" This is what this house says to me. Somebody tell me how to make this happen for myself. Thanks! I honestly cannot believe we found this place. We had google map directions and everything and still drove right past it. We initially decided that it must be in the woods, and in someone else’s property, and we might have to just give up on this one. I’m glad we didn’t. I’m glad I turned around. As we drove slowly back we noticed this narrow gravel drive that looked like someone’s driveway. “I guess I’ll try this one!”, I said, as we chugged up a very steep hill, gravel splashing out from the tires behind us. And then there is was….out of nowhere. It had a gate around it and everything. Somebody must be tending the property cause it was not overgrown. We were elated to find it. We found a whole cemetery full of some of C-Dogg’s distant relatives in here. Unfortunately the one we were really hoping to find, a man who had actually fought as a Revolutionary War soldier, was absent from the party. C-dogg snapped some more pictures and we hopped back in the car. We prepared for the steep descent and were on our way to the next stop. After a few little wrong turns we finally found this quaint little cemetery. We found C-Dogg’s ggg grandfather who moved with the whole family to Indiana from Pennsylvania. It was one of the easiest to find headstones in the whole cemetery, in fact. One thing we found strange about this cemetery was that there were ornamental plantings in front of a lot of headstones, which were actually difficult to move enough to see the inscriptions. I’m not sure I understand the point of planting in front of a headstone. We didn’t stick around in this one for very long because we mentioned to Stacy, our old co-worker, that we would love to come back to the Auditorium before we left town again. We were running a little late. If you haven’t seen a show here then you’re missing out. The murals in the front halls, painted by Thomas Hart Benton are reason enough just to make a visit. We were thrilled to hear that they turned the jankety old University Theatre (which had been closed for years after opening a new Theatre building) into IU Cinema. Sadly, we didn’t make it back onto campus on time and missed seeing the inside of the new cinema, but I’m so excited that it exists. On thing that was shocking and amazing was that they reopened along the north side of the Auditorium. The entire time we went to school there this space was filled with fencing and construction trucks. In fact, we were just reminiscing about the day a woman got stuck at the stop of one of the construction fences and was afraid to climb down. Now it is cleared out and beautiful. There is even a new statue of Hoagy Carmichael (who is from the area) out there with some benches and beautiful gardens. We all sighed, collectively, and were grateful for our alma mater. Thanks, IU and Bloomington. You’re kind of the best. One of my favorite things about Bloomington was driving to and from Indianapolis, because it is a gorgeous drive. It’s better to do it at certain times of the day. Dusk in summer is the absolute best, especially on this most humid days when you can see the air just sit over the fields. 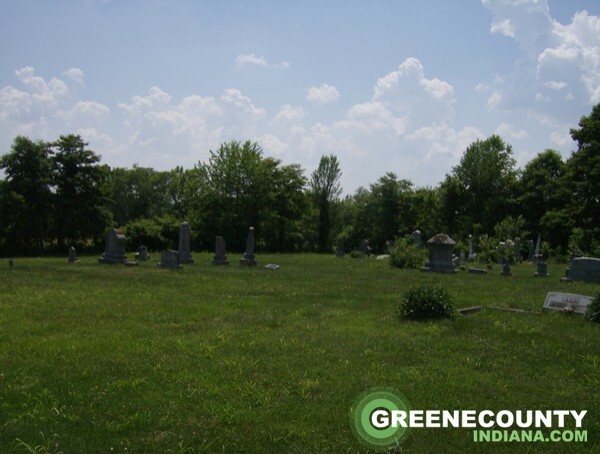 This entry was posted in Genealogy, Other families, Travel and tagged Bloomington, cemeteries, family, genealogy, history, Indiana, Indianapolis by amanita. Bookmark the permalink.